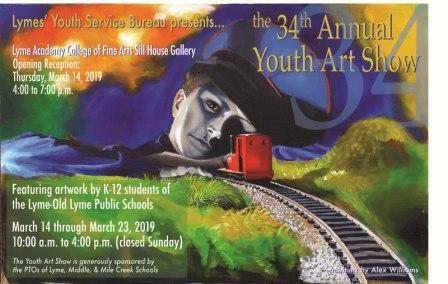 LYSB’s annual Youth Art Show, now in its 34th year celebrates the artistic achievements of the students K-12 of Lyme Old Lyme Schools. The show is a collaboration between LYSB, the Schools, and Lyme Academy College of Fine Arts. The show features drawings, paintings, graphic, and ceramic arts and is held in the College’s Sill House Gallery. This year’s show is generously sponsored by the PTOs of Lyme, Middle, and Mile Creek Schools. Opening Reception: March 14, 4:00-7:00 p.m.